Affected SKUs: Stillness K-994-4 and Purist K-10129-4. The Stillness and Purist floor-mount bath fillers have an adjustable limit stop used to set maximum water temperature. Using a bladed screwdriver, remove the plug button in the handle. Using a hex wrench, loosen the setscrew in the bottom of the handle and remove the handle. IMPORTANT! Note the location of the external screw head in the brass stop before you remove the stop. When the stop is reinstalled, the external screw head must be in the same location. 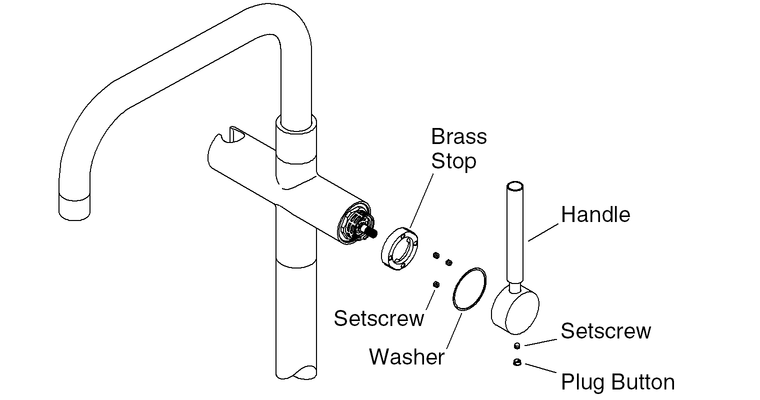 Using a hex wrench, loosen the three internal setscrews in the top of the brass stop. Remove the stop. Remove the red plastic limit stop and reposition it to the desired location. Turn the valve on and test the water temperature with a thermometer. Continue to reposition the red limit stop until the desired maximum water temperature is achieved. Reinstall the brass stop, making sure the external screw head is in the same location as before the stop was removed. Place the handle onto the valve and verify that the nut does not show. If the nut is visible, tighten the nut further. Be sure to push the handle straight down onto the valve. When the nut is no longer visible, tighten the three setscrews in the stop. Reinstall the handle by tightening the setscrew in the bottom of the handle.